Experts warn that the levels of non-performing assets (NPAs) could inch up further in the current quarter. Non-banking financial companies (NBFCs) with large, but relatively low-vintage, loans to real estate developers are the most vulnerable to rising risks for asset quality in the sector, said analysts. According to some estimates, such loans stood at Rs 1.7 trillion at the end of September 2018-19 (FY19). Several NBFCs might not be prepared for the stress, as a large part of their exposure to real estate developers has only come in recent years. “(A majority) of the real estate builder (CRE) funding in last four years (65 per cent incremental) have been driven by NBFCs and housing finance companies (HFCs), which were relatively new to CRE funding (10 per cent of market share in FY14),” analysts at Nomura said in a recent note. These NBFCs’ exposure to developers has come at a fast clip, while banks have been shown relatively more caution. 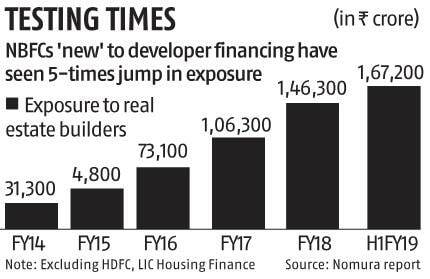 “If we exclude HDFC/LIC Housing Finance, which traditionally have been larger lenders to CRE, the growth of other NBFCs/HFCs in the sector has been at more than 40 per cent compound annual growth rate. Their loan book has grown from Rs 30,000 crore in FY14 to Rs 1.7 trillion in H1FY19,” analysts at Nomura added. Analysts have flagged Edelwiess, L&T Finance, Indiabulls, and Piramal due to their real estate exposures. Among banks, analysts point out that Yes Bank and IndusInd Bank have larger exposures. “Developers are saddled with inventory of more than 40 months of sales in most markets and are over-leveraged. Cash flow constraints and incremental credit from NBFCs have started pushing up NPA levels,” said analysts at Credit Suisse in a recent note. According to CLSA analysts, loans worth $10-15 billion could be under stress (about Rs 70,509 crore to Rs 1.05 trillion). Estimates suggest the stressed part accounts for 15-20 per cent of the total advances of $60-70 billion (Rs 4.23-4.93 trillion) made to the real-estate sector by banks and NBFCs. Weak sale in under-construction housing segment is one of the key reasons for this. 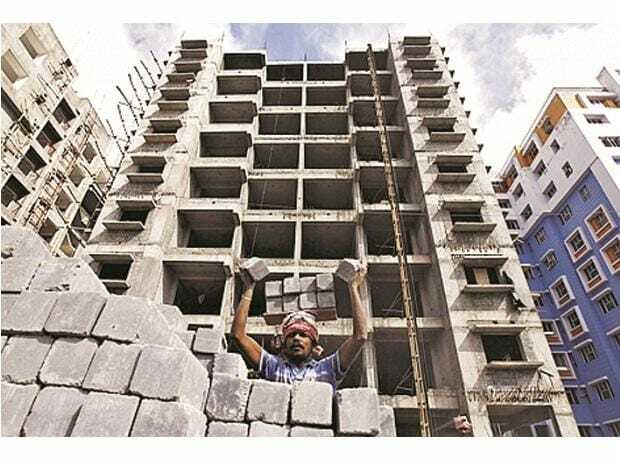 “Construction activity at weaker developers is slowing and signs of stress should be visible from the first half of FY20 onwards, as liquidity among developers gets tighter,” the CLSA said in its note. Risk-aversion from NBFCs would put further strain on developers’ liquidity. Analysts said NBFC disbursements fell 18 per cent on a year-on-year basis in the previous quarter and the decline in current quarter could be even higher. Some of the NBFCs might be better placed to recover their dues. Lenders with cross-collateralisation rights on lease rental discounting (LRDs), unsold inventory or promoter assets will be better-off, analysts said.